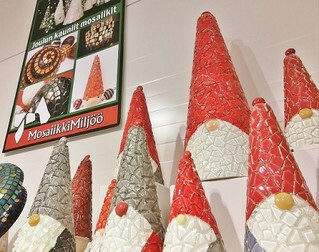 It´s easy to make Christmas elves on the styrofoam cones. 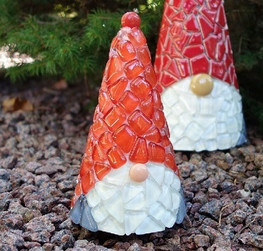 Cover the cones with soft glass mosaics and add glass gems as nose and hat tassel. We recommend Silicone- or Olba glue. You don´t need to grout these elves. O Christmas Tree, O Christmas Tree, How lovely... These Christmas trees have the same idea as the elves. 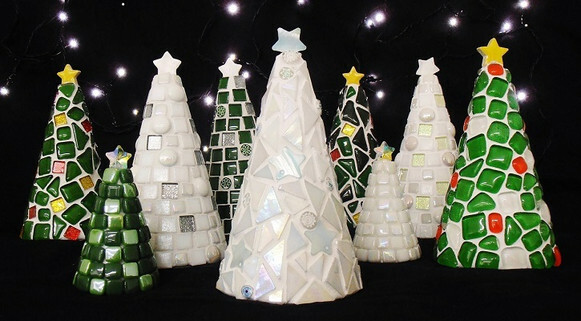 Cover different sizes of styrofoam cones with green, white or with your favorite color, glue the stars to the top and grout them. Make Christmas cards and Christmas package cards by adding them micro mosaics and millefioris. Choose different size styrofoam balls and cover them with Lilliput gems, Ottoman glass and 1x1 cm mini glass. Use Silicone- or Olba glue and grout mosaic balls. You can also mix approximately 5-10% of pigment into grout to get your favorite color.